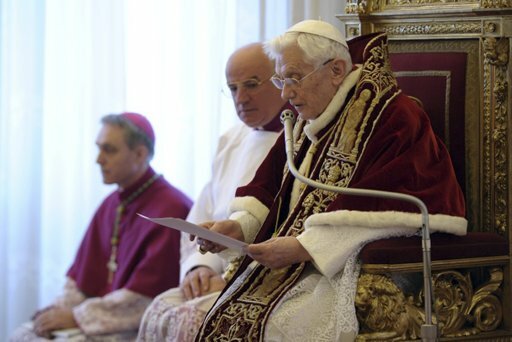 Nearly eight years since his election, Pope Benedict XVI announced this morning that, at the end of the month, he will become the first Roman pontiff since Celestine V in 1294 to resign from the Chair of Peter. Beyond the statement, no timetable or other parameters are currently known on the holding of a Conclave – we're in very uncharted territory here, folks, so please be patient. The lone item of canon law to even mention a pontiff's resignation is Canon 332, paragraph 2, which states that "If it happens that the Roman Pontiff resigns his office, it is required for validity that the resignation is made freely and properly manifested but not that it is accepted by anyone." Along the same lines, there is no established protocol whatsoever for the titles, status or prerogatives of a retired Pope. On Friday, Benedict raised some eyebrows by having a rare private audience with the Dean of the College of Cardinals, the 85 year-old Italian Angelo Sodano, the figure who would be responsible for the convoking of a papal election. The departing pontiff ostensibly communicated his plan to the Cardinal-Dean at that point. That said, as both Sodano and his Vice-Dean, Cardinal Roger Etchegaray, are past the eligibility age to vote, under the norms currently in place, the duty of presiding over the Conclave would seem to fall to the senior cardinal-bishop younger than 80: the retired prefect of the Congregation for Bishops Giovanni Battista Re, who turned 79 in late January. Under the operative norms governing Conclaves in the wake of a Pope's death, the voting college is to start the election between 15 and 20 days from the moment of vacancy. In this case, however, the traditional novemdiales – the nine days of official mourning before the election – would not apply. Now comprised of 118 voting members younger than 80, the College as a whole – retirees included – governs the church during a papal interregnum. They Did... Or Did They? Amid LA "Sins," A Call for "Saints"